With Christmas quickly approaching many people have begun thinking about where they are going to get their Christmas tree from this year. If you are environmentally conscious there are several things that you should consider before purchasing a tree. Many people who wish to go green try and find eco friendly Christmas trees. What Is an Eco Friendly Christmas tree? An eco friendly Christmas tree can be made up of different types depending on what you do with that tree. There are many different options when going green for a Christmas tree. You will always have the following options. Artificial. These are typically thought of as being better for the environment. Some can be better for the environment while some can be worse. Your typical artificial tree may be made up of petroleum and other materials that are not good for the environment. If you want to find an artificial eco friendly Christmas tree you should look for ones that are made out of recycled plastic and will not degrade. Most of these trees will have a label on them. Live Trees. While generally not recommended many people purchase live Christmas trees. Purchasing live Christmas trees can harm the environment but you can get eco friendly Christmas trees. Simply look for a Christmas tree that has a root ball. After you get done with Christmas you can plant your tree and it will continue to grow and provide oxygen. You can also look for certified Christmas tree growers who do not use pesticides and other harmful chemicals to treat their trees. One final option to the eco friendly tree is to make your own tree. You make your own tree by decorating a house plant, drawing a Christmas tree or building a wood Christmas tree. Where to Purchase Eco Friendly Christmas Trees? There are many different locations where you can purchase an eco friendly Christmas tree depending on what type you want to get. If you want to get a live Christmas tree visit a local tree farm and ask them questions. If they are not a green farm they can usually tell you where a green farm would be located. If you want to purchase an artificial Christmas tree you can do so by looking online or in your local store. Make sure that you check to see what recycled materials make up the tree and make sure that the seller has a good reputation for selling eco friendly Christmas trees. Purchasing eco friendly Christmas trees are a great way to contribute during the holiday season. If you must purchase a live tree without a root ball there are ways that you can recycle that tree and still keep it green. Some towns will take it and turn it into mulch; you can also do this yourself. You can also sink the tree if you live near a lake to let it be a habitat for fish. Other things that you can do with your Christmas tree include donating it to a tree farm, making bird houses and using the log from the tree to stabilize a creek near your home. 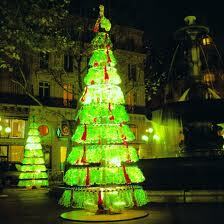 No matter what kind of Christmas tree you get you will be able to find some way to make it eco friendly.